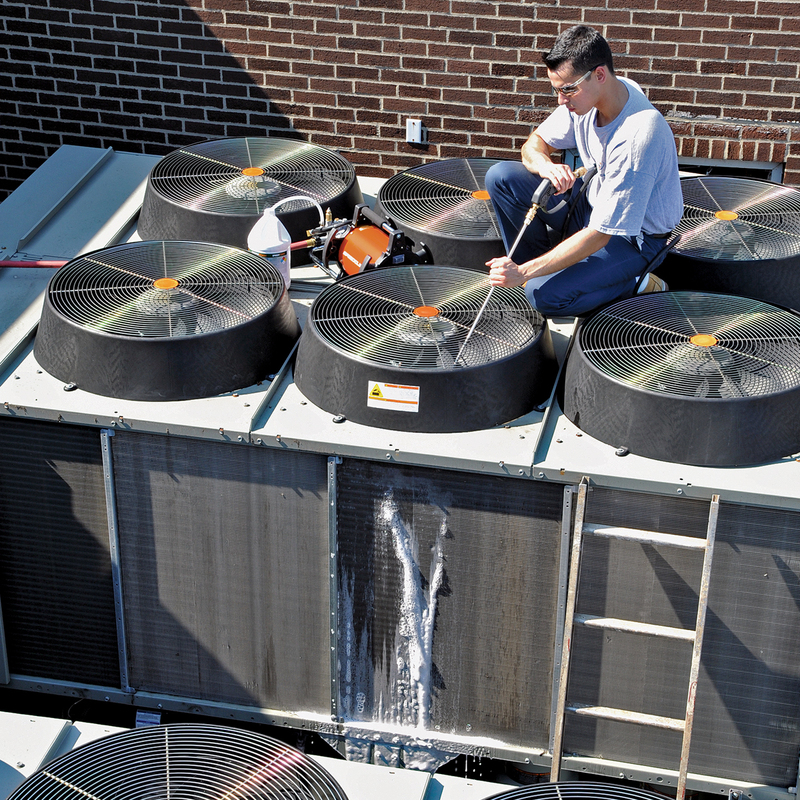 Make quick work of cleaning debris and grime from microchannel, thick condenser and evaporator coils. Powerful 400 PSI at 2.2 GPM washes even the dirtiest coils with a continuous spray of water and cleaning chemical— without damaging sensitive fins. Professional results from a compact, portable solution. FLOWJET-A-50 (220v/50HZ) also available. You’ve got thick beds of coils to clean. The pressure washer is too bulky for cleaning in narrow spaces, releases too much pressure and the hose attachment just can’t get all the way through the coils. Well, this is the tool for you. 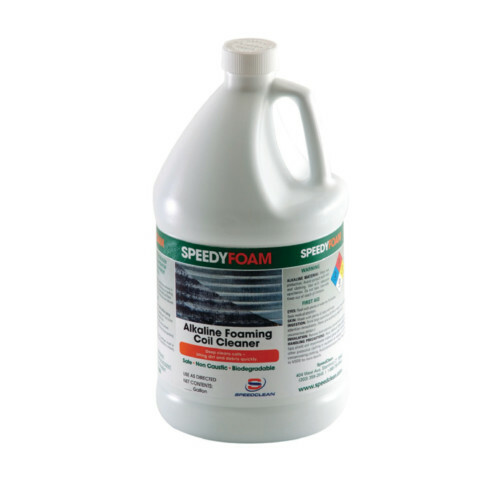 The FlowJet™ from SpeedClean delivers the pressure you need and water flow rate to power through even the dirtiest, thickest coils. Plus, it’s portable and compact. Perfect for the truck or storing when not in use. 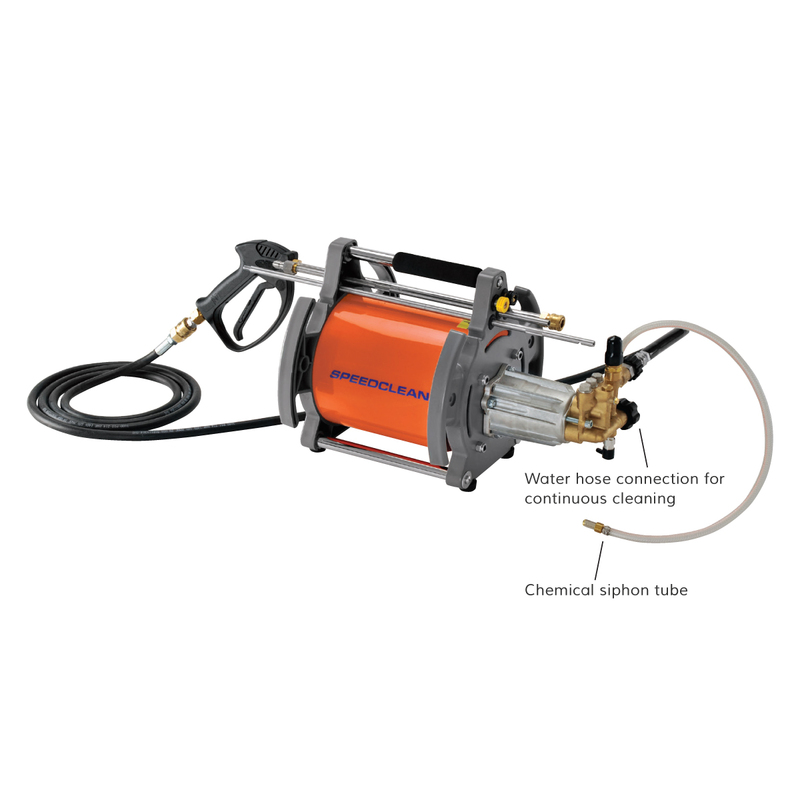 It boasts a unique pump system that is almost impossible to replicate, offering 400 PSI of cleaning power at 2.2 GPM. It also has a variety of optional attachments to help clean hard-to-reach coils and coil beds. 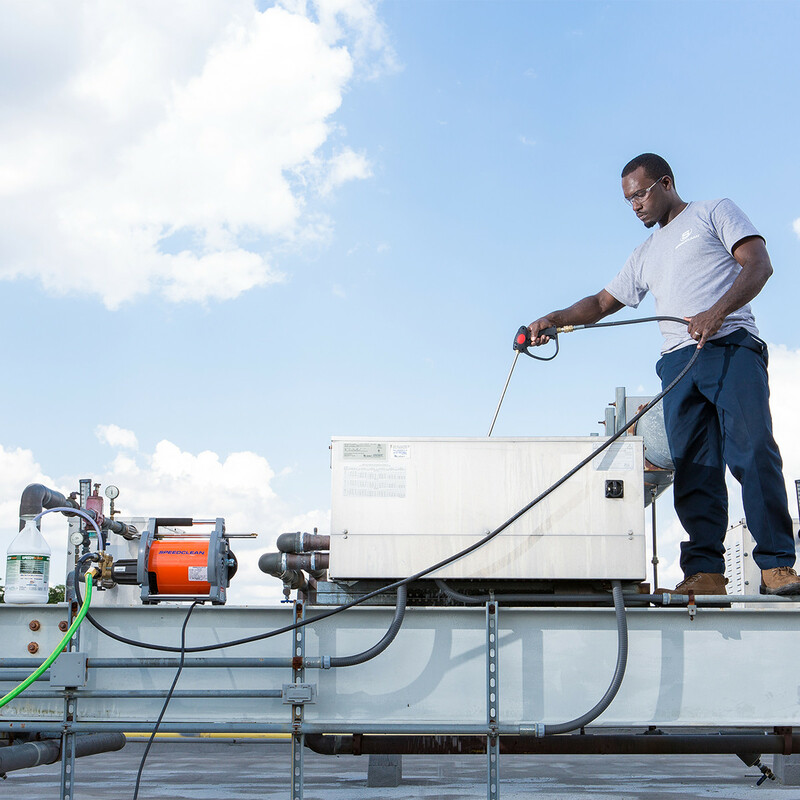 Powerful 400 psi spray powers through coils – up to 6′ thick! Optional SC-WWSS-HF spray wand with 90° nozzle lets you clean coils from the inside out, forcing dirt and debris back in the direction it entered. Perfect for microchannel coils. 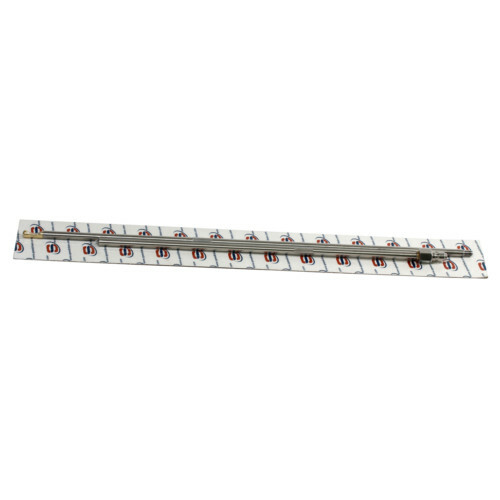 How heavy is the FlowJet? The FlowJet weighs 35lbs dry. As always, caution should be used when lifting heavy objects. Do I need to use the nozzles it came with or can I get my own? You should only use the nozzles that came with the FlowJet as they are specified for use with the pump. 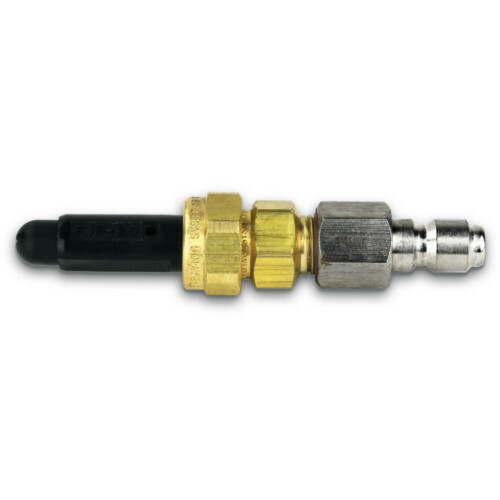 In fact, make sure that a nozzle is always attached the FlowJet otherwise it will not perform properly.